From start to finish your orders will managed within KIHM’s E2 Shop System™. This system coupled with KIHM’s AS9100 approved quality system allows for complete management of the order fulfillment process, from estimate to delivery our team is committed to delivering the best value with a high level of transparency for our customers. Estimating. KIHM utilizes E2 Shop System ™ to build a preliminary router outlining all the required actions for the proposed work, consulting with and consolidating inputs from the engineering, quality, and production departments. We work to make our estimates are as accurate as possible as early as possible, ensuring quality at the source. Customer Quotes. Using the data compiled from the estimating process a quote will be issued, usually within 1-2 days from the receipt of an RFQ. We deeply enjoy the opportunity work closely with our customers to develop the best fit solution. Orders. 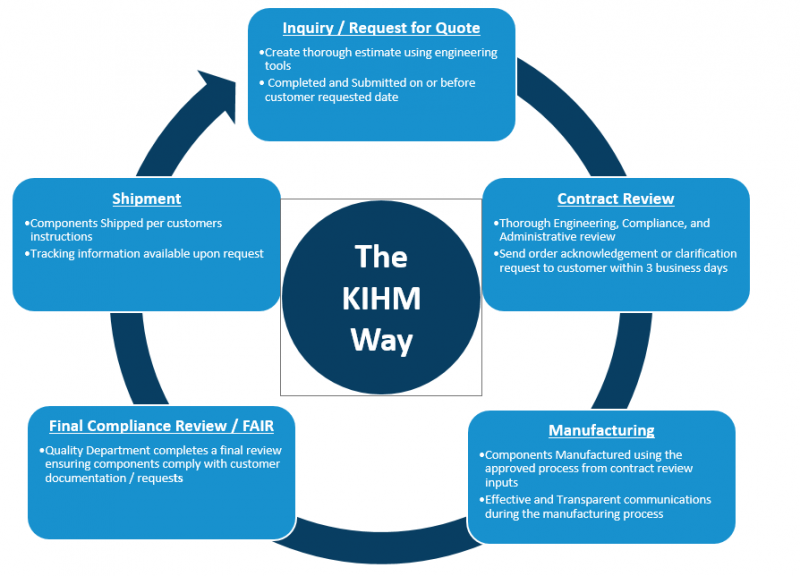 KIHM’s AS9100 approved Quality System certifies that all new purchase orders undergo a thorough contract review and requirements review to validate all required pieces of information are present and KIHM has the capability to manufacture the requested parts in compliance with customer instructions. Shipments. Once the order has been completed KIHM will ship according to our customer’s shipping instructions. KIHM’s CAD Platforms include Solid Works, MasterCam Solids, Inventor, and NX. CAM Platforms include Surfcam, Multicam Solids, and Cimco. Our CMM Programing softwares include Open DMIS and Virtual DMIS software. Our quality system ensures control of engineering and CAD data throughout the production process. * Our mission is to provide customers with solutions by maintaining a culture committed on continuous improvement of processes, products and services, and on time delivery needs. * We commit to comply with customer requirements through product conformity and compliance. * We commit to continuous improvement on the effectiveness of the quality management system.